Beetles are a diverse group with more than 300,000 different species. Most have two pairs of wings; the first pair serves as a hard, shell-like back. Their wings are exposed only during flight. A beetle's body consists of three sections: a head, a thorax, and an abdomen. Beetles sometimes attempt to invade homes at the end of summer, in search of shelter. During this time, their population around entranceways can grow quite large. Most beetles only live about one year, although some of the species can live longer. Their life cycle also depends on access to food. Wood-destroying, fabric-eating and grain-infesting beetles pose the largest issues. Carpet beetle larvae may damage carpeting, clothing, hair, fur and animal hides. They will also feed on the fur left on animal carcasses such as from mice, rats, or squirrels that may have died inside of a wall, below a floor, or in the ceiling or attic. As stated above, they may also be found in food products, including milled products such as pastas, cereals, nuts, etc. Most homeowners spot the larvae or beetles crawling along a surface somewhere. They may wander into areas away from where they feed. They will chew irregular holes in fabrics including wool carpeting, but often feed on the nap of the fabric without eating the base threads. A common food source for carpet beetles is pet hair. In areas around or behind furniture, accumulation of hair may provide ample food for this pest. We offer specific applications for both inside and outside control. We typically deal with two groups of carpet beetles: the varied carpet beetle and the black carpet beetle. 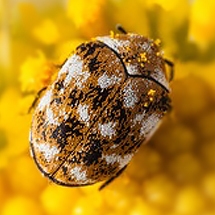 The most common beetle in Idaho is the varied carpet beetle. The adult is about 1/10 inch in length. The back of the insect has an irregular pattern of white, brown and yellow scales. While adults are pollen grazers, larvae feed on natural fibers and can damage carpets, furniture, and clothing. This beetle can fly rather high and enter homes through open windows. 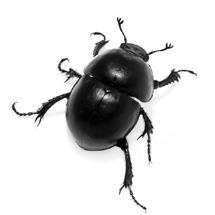 The adult black carpet beetle is black in color, oblong shaped, and ranges in size from 1/8 inch to 3/16 inch in length. Carpet beetles go through complete metamorphosis which includes egg, larvae (crawling stage), pupa (cocoon) and adult (beetle). Larvae of the black carpet beetles are fairly distinctive. They are quite hairy and are striped tan and white in color. There may be tail bristles (hairs) visible at the back of the insect as well. Inspection commonly reveals either live larvae or sometimes cast skins of the larvae. It is this stage of the insect that actually ingests the fabric or other food. 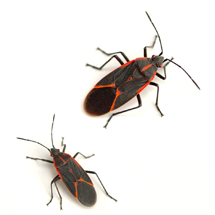 Boxelder bugs are found throughout the United States and are approximately 1/2 inch in length. They are dark brown to black in color with conspicuous red markings on their backs. They are especially fond of feeding on the leaves, twigs and seeds of female boxelder trees. They will also feed on maple, ash and the young fruit of grapes, apples and plums. The adults overwinter in dry protected locations. They emerge in the spring and lay small red eggs in the cracks and crevices in the bark of boxelder trees. The nymphs hatch about the time the new leaves appear. The young bugs feed on the leaves and twigs, going through five molts before becoming adults. Boxelder bugs do little apparent damage to the boxelder tree. They become a nuisance around homes when they attempt to enter to find overwintering sites. Boxelder bugs can be very prolific during summer months. Their control usually requires multiple insecticide applications throughout the summer and early fall.